You have been reading ‘Feral Future‘ by Tim Low. A fascinating book on the ecological disaster perpetuated by human in this continent. His argument is flawless, his research and historical account are excellent and extensive. 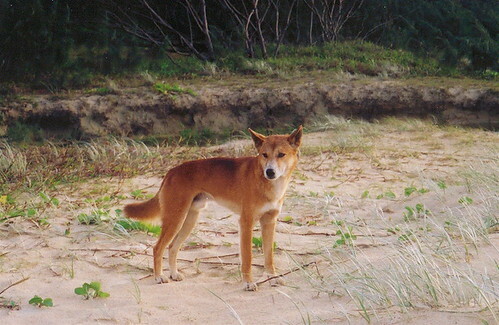 Low trace back the slow intrusion of animals, plants and diseases in this continent by the hand of humans through the past 4,000 years, when Indonesian imported dingoes on the Australian soil. You find yourself entangled in this reading, acknowledging on the one hand the ecological disaster and at the same time finding strength in your argument. Humans changed the landscape since the beginning of agriculture. Humans purposely interacted with fauna diversity since the beginning of hunting. Humans interacted with the environment since the beginning of gathering. Bio-diversity has been reshaped for million of years by climate changes and natural disasters too. Your argument doesn’t try to undermine Low’s research, rather it operates on a different platform. Your argument revolves around the need of human to reconnect with the environment. Not even farmers nowadays are connected to the environment, you know very well as you were one too. The need of yield from fields to foster our economically driven existence push farmers to specialize in monocultural crops, few farmers today attend to more then one product, be it animal or botanical derived. Ralph Waldo Emerson described a weed as ‘a plant whose virtue have not been discovered yet’. You would argue that most plants virtues are known already, or better, were known, we only forgot. Low acknowledges this by suggesting several weeds suitable for various tasks. The book is so full of data, you find yourself in need to plug out some of it and splash it on this blog. 8000 to 18 000 BC: Cuscuses are introduced into New Ireland. They are later distributed widely through the islands of the New Guinea region. 10 000 BC: Wolves are tamed in western Asia, leading to the development, by genetic selection, of the dog, a valued hunting companion because of its speed and acute smell. 7000 BC: Goats, Sheep, wheat and barley have been domesticated in the Near East. The first weeds of agriculture no doubt appear at this time, and the sparrow begins its long association with people, learning to nest under roof and steal grain. 5000 BC: Pademelons are taken to New Ireland. In China, rice is brought under cultivation in the Yangtze delta, and the first weeds of rice probably appear. The domestications of pigs and water buffalo may have begun. Rice, pigs and water buffalo later become exotic species in northern Australia (rice along the Ord River). 3000 BC: Grain infested with flour beetles is placed in Egyptian tombs. 3000 to 2000 BC: In one of the most eclectic introductions of exotic mammals anywhere, pigs, dogs, monkeys, goats and cuscuses are brought to Timor. 1500 to 2000 BC: Indonesians import the dingo into Australia, along with its parasitic worms, which go onto infect kangaroos and wallabies. 1600 BC: Egyptians have domesticated the cat. Its is welcomed into homes as a mouse-killer, a protector of grain. Later it is revered as divine. The cat goes on to become a feral pest all over the world. 1400 BC The Lapita people (from present day indonesia) start to spread through the Pacific Region, taking pigs, pacific rats and plant food, and probably distributing the mourning gecko and certain snails and insects. Aided by their rats and pigs , they exterminate vast numbers of island birds. 1000 BC: Sparrows and starlings are living at the bronze age settlement of Apalle, in central Sweden. The sparrows have spread well north of their original home in the middle-east, and later they colonize England, from which they are brought to Australia. 31 BC to 476 AD: During the roman era many plants and animals are distributed across Europe, North Africa and the Middle East. Mice are so prolific that Pliny claims a single mother can give birth to 120 offspring; they are thought to became pregnant by licking salt or each other. The feral porcupines found in southern Europe today may date from this time. Nettleleaf goosefoot ( Chenopodium murale), Vervain (Verbena officinalis) and other weeds appear in England. From about the tenth century the Asian house rat is transported by islanders through-out Micronesia, and Pacific rat reach Norfolk Island, presumably carried there by Polynesians, who also bring Banana plants. During the twelfth century rabbits reach England, imported from continental Europe as a luxury food; by the 1250s they have become a localised nuisance. By the thirteenth century black rats reach plague numbers in western Europe. During the fourteenth century bubonic plague, carried by infected fleas on black rats, devastates Europe. It probably arrives with Genoa trading ship from the Black Sea port of Kaffa, reaching England and Italy in 1348, Germany, Scandinavia and Poland in 1349-50. In its first three years the Black Death fells more than one-third of the population of Europe. No one Knows the death toll in Asia. Early in the e fifteen century, Chuo Ting-wang compiles the Chiu-Huang Pen-ts’ao, a treatise on plants fit for food in times of famine, many farm weeds are mentioned, including Dandelion (Taraxacum officinalis), Sowthistle ( Sonchus oleraceus), Amaranth (Amaranthus species), Plantain (Plantago species), Fat hen ( Chenopodium album) and Sheperd’s purse( Capsella bursa-pastoris). All of these weeds later find their ways into Australia. During the sixteenth century the dodo, a symbol of extinction today, is wiped out by two exotic pest- pigs and monkeys- brought to its island home of Mauritius by European seafarers. From there the writer launches in the Australian recent botanical history, but this will be the subject of further postings. Your time is up at Bundanon, you leave behind a self-guided tour in the form of a brochure. If you, reader, ever going to come by do get a copy and take the short walk which it suggest, discovering plants we connect with in many forgotten ways. Here you will find a PDF copy of the brochure, 450kb. This entry was posted in Bundanon, Cultural diversity, Recipe, Remedy, WeedyConnection. Bookmark the permalink.